These gathering blocks made with a hard maple base. Designed to save space and will fit in most kitchens to save counter space for an extra food prep station. The tops are made 4" thick and are 18" wide 36" long. These butcher block tops are end grain made out of reclaimed hard maple from our shuffleboard manufacturing. Each table features a pull out drawer large enough for a full size butcher knife. Butcher block tops are finished with a food save mineral oil and bees wax. These gathering blocks made with a hard maple base. Designed to save space and will fit in most kitchens to save counter space for an extra food prep station. The tops are made 5" thick and are 24" wide 48" long. These butcher block tops are end grain made out of reclaimed hard maple from our shuffleboard manufacturing. 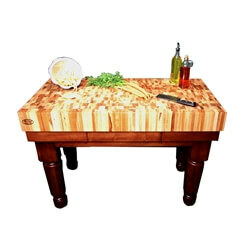 Each table features a pull out drawer large enough for a full size butcher knife. Butcher block tops are finished with a food save mineral oil and bees wax.